The School of Communication offers course credit for participating in an internship. Students can enroll in COMM 490 to ensure a positive and safe internship environment. Employers increasingly want to see experience in the new college grads they hire. A staggering 95 percent of employers said candidate experience is a factor in hiring decisions, according to an annual survey by the National Association of Colleges and Employers. Nearly half of surveyed employers wanted new-grad experience to come from internships or co-op programs. If you have completed internships, you will clearly have an edge over your classmates who haven’t. Ultimately you are responsible for securing an internship. There are several resources for you to accomplish that. There are internships posted through Career Services as well as on the Communication Blackboard site. What type of internship can I get? Communication is a broad field. Therefore, there are multiple types and possibilities of internships that we will accept. Your internship should have something to do with communication and a job field where you hope to work someday. I already have a job. Can that be an internship? NO. An internship should further you knowledge and training beyond what a regular paying college job would. It should be in an area you are trying to gain experience in for the future. Can my internship be paid? YES. We encourage paid internships. However, there are several internships that are not paid and why we believe you should get credit. Can I get credit for my internship? YES. Each semester you can register for (1) unit of COMM 490 Internship credit. You can repeat this for a total of (3) units or three semesters. For one unit of credit you must work a minimum of 45 hours in one semester. Some internships may require you to work more. How do I add an internship to my schedule? 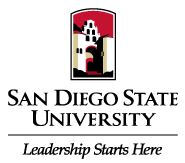 Contact Dr. Kathleen Czech, kczech@mail.sdsu.edu to start the internship process. You must have a Service Learning Agreement with the company and SDSU. Once your internship is approved you will be given a code to add the course. I already had an internship, but didn't get credit. Can I get credit for it now? NO. You must actually be doing the internship in the semester you are registered. No retroactive credit will be given for internships already completed.